Results for the 2016 ASSU elections were posted early Monday morning on the ASSU elections website. Originally slated for release on Saturday afternoon, the elections commission took the two additional days to “validate the results.” According to an email from the elections commission, the candidates ranked 15th and 16th for the Undergraduate Senate had been separated by just one vote, requiring the commission to ensure that each vote was valid. 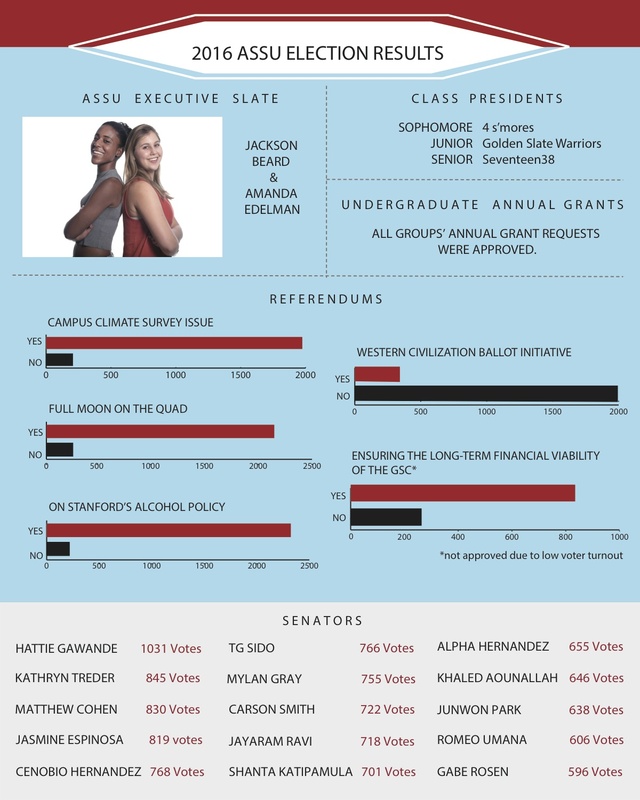 Aside from the Undergraduate Senate, candidates on the ballot also included the ASSU Executives, the Graduate Student Council, as well as the undergraduate Class Presidents. From April 7th to 9th, the student body voted for these representatives as well as four referendum issues and club Special Fees. The Executive slate of Jackson Beard ’17 and Amanda Edelman ’17 won 2397 votes, while the joke slate of Tristan Navarro ’18 and Scott Mutchnik ’19 won 626 votes. Beard and Edelman campaigned on a platform focusing on the student voice, proposing more funding for campus psychological services, platforms for dialogue among faculty, students and campus communities, as well as greater diversity in faculty and campus health staff. Their focus on mental health, sexual assault and campus diversity mirror the outgoing Executives’ goals. In addition, the winners of the 18th Undergraduate Senate elections are, in descending order of votes, Hattie Gawande ’18, Kathryn Treder ’18, Matthew Cohen ’18, Jasmin Espinosa ’18, Cenobio Hernandez ’18, TG Sido ’18, Mylan Gray ’19, Carson Smith ’19, Jayaram Ravi ’19, Shanta Katipamula ’19, Alpha Hernandez ’19, Khaled Aounallah ’19, Junwon Park ’19, Romeo Umaña ’19 and Gabe Rosen ’18. The joke candidate Emperor Palpatine got a whopping 752 votes, which would have made them the 8th Senator to be elected. Unfortunately, the votes were deemed invalid, leaving Palpatine to try again next year. This year, a total of four referendums made it to the ballot. The referendums on the proposed Western Civilization requirement, Stanford’s open-door alcohol policy and Full Moon on the Quad were submitted by students and relied on petition signatures to reach the elections ballot. The fourth and final referendum on the campus climate survey was placed on the ballot by the 17th Undergraduate Senate. The referendum on hard alcohol has drawn 2,323 ‘yes’ votes, making it the most unifying referendum issue by percentage (91.46% voted ‘yes’) as well as the issue that drew the highest turnout. The referendum in favor of keeping a school-sponsored version of FMOTQ saw 2,149 ‘yes’ votes, or 88.55% voting in favor. The explosive news that the Office of Student Affairs was considering an end to administrative support for Full Moon on the Quad (FMOTQ) saw the launch of a petition opposing the proposal within hours. At the Senate meeting where the news first leaked, Senators raised concerns that banning FMOTQ would merely force the event to go underground, leading to riskier drinking and increasing the potential for sexual violence. Senators also criticized the administration for placing the onus on the Senate to break the news to students, rather than announce it to students directly. The Stanford Review’s controversial petition to start a Western Civilization humanities requirement at Stanford gained enough votes to make it to the ASSU ballot. However, petition signers such as Grant Avalon ’17 were often ambivalent about the Review’s Western Civilization-centric proposal, deeming it “better than the status quo, but perhaps not the best proposal”. The strong reactions drawn by the Review’s proposal led to a counter-petition for an enhanced but more pluralistic humanities requirement at Stanford. Several Senate candidates such as Carson Smith ’19 and Mylan Gray ’19 also supported a Diversity in the Major requirement with an emphasis on diverse cultures. The ambivalence even among the Review petition’s supporters was reflected in the polling results, which saw the Western Civilization requirement gain a mere 342 ‘yes’ votes and 14.65% of the vote — the least in number and percentage of all four referendum issues. The referendum has garnered 1,975 ‘yes’ votes, making its 90.60% approval rate the second-highest of the four referendum issues. The 17th Undergraduate Senate voted to place the campus climate survey referendum on the ballot, skipping the step of garnering student signatures. The referendum came in response to the widely-condemned 2015 campus climate survey results that found a mere 1.9% campus sexual assault rate. Among the main criticisms were the Survey’s narrow definition of sexual violence, and the limited statistics made available to the student body. In response, the Senate’s referendum called for a Campus Climate Survey based on the methodology of the 2015 Association of American Universities (AAU) survey, and to have it repeated at least once every three years. The winning sophomore, junior and senior class president slates are 4 s’mores, Golden Slate Warriors and Seventeen38 respectively. Both the junior and senior class presidents ran unopposed in the elections. In addition, all 58 undergraduate groups seeking Annual Grants and all three Joint Special Fees groups were approved for funding.